Canberra is the capital of Australia. Much like the United States’ District of Columbia, Canberra and its surrounding areas are their own territory by ACT (Australian Capital Territory). Designed by an American Architect, Walter Burley-Griffin, the city branches out from two circles - one North and one South of the man-made lake named after the architect. It is nestled between Mt. Ainslie and Black Mountain. We came to Canberra to see the Parliament building, nestled on the top of the hill. We took a self-guided tour in the Parliament building, read some plaques and signs and read the ‘Magna Carta’. Visitors could even sit in a parliament session, but we missed the session that day, so we entered the open debate room and pretended to debate. I was surprised at how relaxed the security inside the building. But our visit was before a famous incident about a debate that heated into an argument and punches were thrown outside the steps of the parliament. As expected from a nation’s capital, we found rows and rows of foreign embassies which we toured. We also climbed the Telstra Tower at Black Mountain and saw a panoramic view of the city. Other than the government buildings and scattered museums, there's not much to see for travelers in Canberra. So it was such a treat to find Canberra’s spring festival of flowers - Floriade. (We visited in October, spring in Australia). 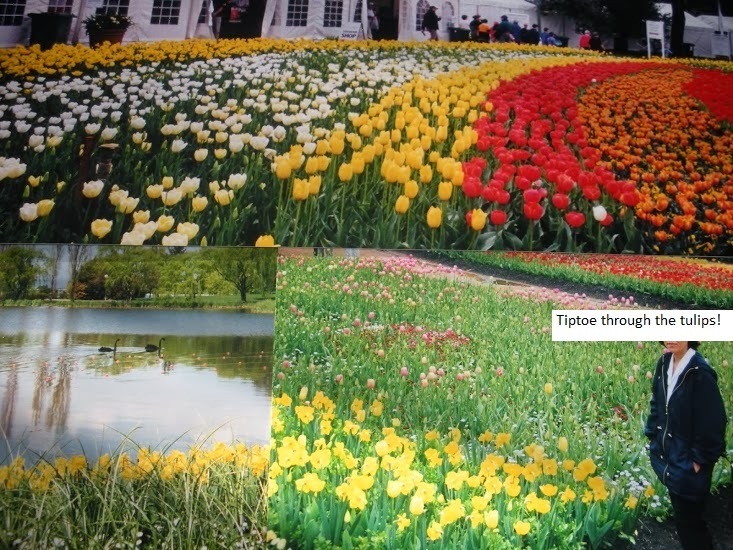 I have never seen the biggest tulip gardens outside of Holland. It made the three-hour drive from Sydney definitely worth it. I did some photo manipulations by stitching a few pictures together, adding 'memes' (typing texts over my face), and re-sizing the photo to make it load faster. Hence, the poor image quality.